Pollination is critical for flower reproduction, but insects aren't the only creatures that help pollinate flowers: hummingbirds play a crucial role in the pollination of many different flower types. Many flowers have even evolved specific characteristics to entice hummingbirds to help floral reproduction. Pollination is the act of transferring grains of pollen containing reproductive cells between male and female flower parts. Of the hundreds of thousands of flowers in the world, including flowering shrubs and trees, 90 percent of them require assistance for pollination, whether it is help from an insect, bird, or mammal. Zoophily is the term used to describe pollination that is assisted by vertebrates. Hummingbirds are important players in the process, particularly for tropical flowers in the New World. Color: Hummingbirds are most attracted to red, pink, yellow, and orange blooms, and flowers may have solid colors or patterns of those colors to attract attention. Because birds see color along a greater spectrum than humans, ultraviolet shades can also play a part in attracting hummingbirds. Shape: Long, tubular blooms are ideal for hummingbird bills, and the tubes can hold a greater reservoir of nectar to accommodate birds' appetites and keep them interacting with pollen for longer periods. The most popular hummingbird flowers often have a funnel-like shape that helps nectar accumulate in the base. Thin flower tubes can also exclude insects or other animals that may hurt blooms rather than help pollination. Scent: Because scent is not a strong sense for most hummingbirds, flowers that specifically target these birds for pollination assistance usually do not have much aroma. Instead, flowers with strong smells often attract insects more easily, including hummingbird moths. Position: To accommodate hummingbirds, flowers are often positioned so the birds can comfortably feed while hovering without brushing their wings on adjacent stems or leaves. The exact angle of the blooms can often attract different hummingbird species that may have different bill shapes, such as curved bills. Bloom Time: Because hummingbirds are diurnal, flowers that rely on these birds for pollination are open and accessible during the day. They often open quickly in the morning, and they may have longer blooming seasons to take advantage of the birds for as long as possible. Nectar Production: The more nectar a bloom produces, the more hummingbirds it can feed, and the more often the birds can visit, therefore increasing the chances of successful pollination. Thousands of flowers have evolved to use hummingbirds for pollination, with the greatest diversity of flowers in tropical regions where there are more hummingbird species. Simple Disruption: Just knocking pollen grains around inside a single flower may lead to successful pollination. When a hummingbird nudges a flower with its bill or creates a breeze with its wings, that disruption may be enough to pollinate the flower. Bill Transfer: Pollen is sticky and can easily adhere to a hummingbird's bill as it sips nectar from a flower. When the bird visits a different flower, that pollen is transferred to a new bloom for pollination. Head Transfer: Very deep blooms often have long stamens and tall anthers, the parts of a flower that contain the pollen. When a hummingbird inadvertently brushes against the anther, the pollen may stick to the bird's head to be transferred to the next bloom the bird visits. Different hummingbird species may visit different types of flowers throughout the year, depending on individual flowers' bloom cycles and other available food sources. As the birds change their diets to different flowers, they help pollinate entirely new types of flowers. Design a hummingbird garden with vertical layers and tiers for easy flower access. Plant different flowers that attract hummingbirds to encourage more birds to visit. Avoid using insecticides or other chemicals that can deter hummingbirds. Opt for native flowers, plants the birds are most familiar with, whenever possible. Hummingbirds are efficient pollinators. 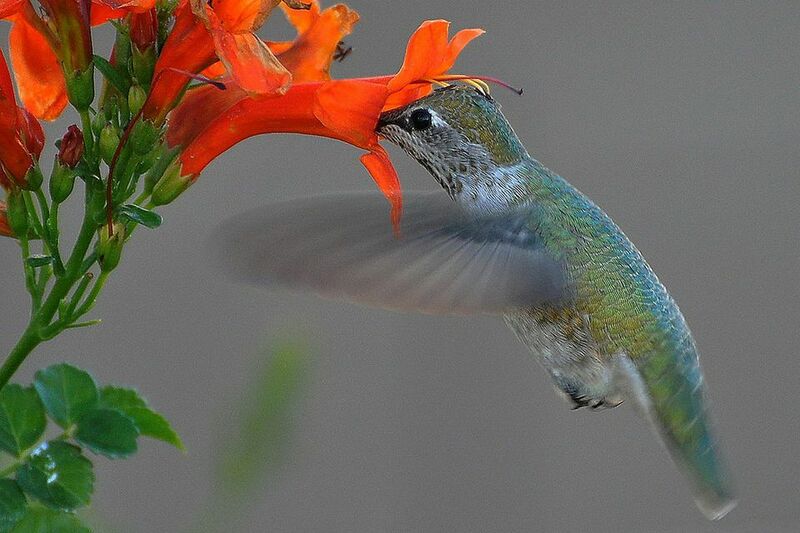 Understanding what flowers have done to encourage that assistance and how the birds pollinate flowers can help birders better appreciate hummingbirds and meet their needs in the garden.